Talent comes in all forms, and sometimes, the most unlikely suspects can sometimes prove to be hiding the most impressive talents.That’s exactly what happened in this amazing video, when a traffic warden comes across an abandoned piano in the middle of the street. Luckily someone caught this amazing moment on camera for the whole world to see. As he starts to play, he seems to get lost in the moment, tinkling the ivories like i’ve ever seen before. This really is a perfect example of never judging a book by it’s cover, as he really is a truly hidden gem that the world needs to see.ou would not want to miss this spectacular performance. 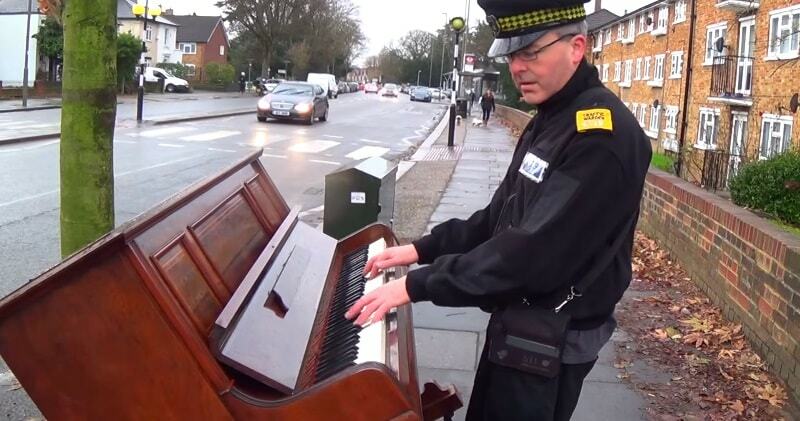 This traffic warden is a professional pianist Brendan Kavanagh. This amazing yet unexpected performance of him was recorded and shared with his Youtube channel. His piece was hard yet he seemed as though it was the easiest musical piece ever made. Well, we deserve a bit of a surprise sometimes. It’s about 100 years old and made in Berlin. It’s surprisingly okay but it’s a bit out of tune. All the notes are working and I’m going to get it tuned up and see if we can make a few videos with it … It’s a shame when these pianos are abandoned because I’ve seen quite a few of them around London.